Research in the laboratory is focused on the molecular mechanisms that control carcinoma progression, metastasis, and immune evasion of tumor cells. 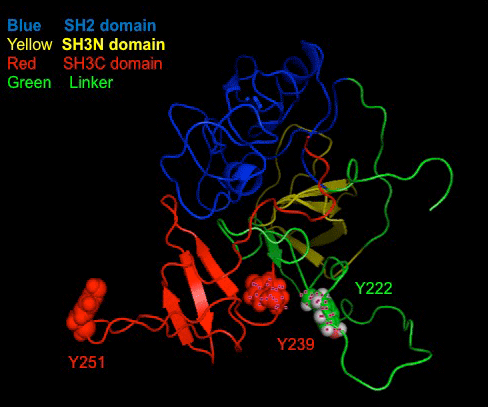 The SH2 and SH3 domain containing protein Crk is one of the most versatile genes in eukaryotic cells, binding many signaling proteins that are involved in cell proliferation and cytoskeletal reorganization. The clinical significance of Crk in human cancer has been enumerated in recent years, as Crk is frequently over-expressed in several different cancers, including breast, ovarian, gastric, lung, glioblastoma, and sarcomas and siRNA-mediated targeting of Crk reverses the malignant and metastatic features of these cancers. These findings have led to a new urgency to understand the mechanisms by which Crk promotes malignant transformation in the hope that new information can be exploited to develop therapeutics, particularly for tumors with a predisposition towards invasion and metastasis. Three dimension structure of the Crk oncogene: The domains of Crk are indicated by color. Our research has shown that Crk becomes tyrosine phosphorylated on Tyr251 and Tyr239 in breast and lung cancer cells. Close-up structure of the carboxyl-terminal Crk SH3 domain. The red area shows the position of the RT-loop where and where Tyr251 points away from the domain surface. This is the only SH3 domain that becomes tyrosine phosphorylated in the RT-loop. 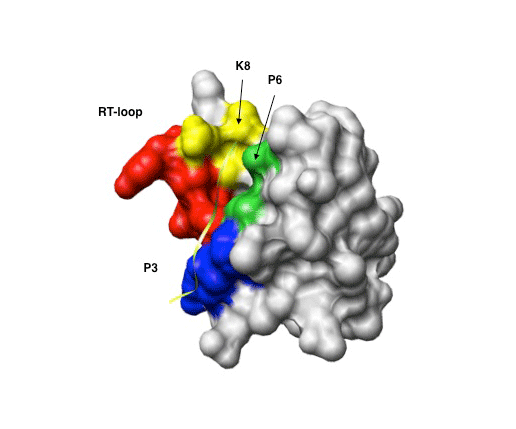 In recent years, we have identified a new signaling paradigm for Crk by the identification of two previously uncharacterized tyrosine phosphorylation sites located within the carboxyl-terminal SH3 (SH3C) domain, an atypical SH3 domain that does not bind to conventional poly-proline containing sequences. Using mass spectrometry and phospho-proteomics, and by creating specific antibodies to these sites (Tyr239 and Tyr251), we have shown that in addition to its canonical role as an adaptor protein, Crk has an unconventional role in signal transduction through phosphorylation of Tyr251 and Tyr239 that define new binding sites allowing recruitment of SH2 and/or PTB domain containing proteins, including Abl, Arg, and Shc which are implicated in invasion and metastasis. We have found that Crk is phosphorylated by a variety of tyrosine kinase oncogenes suggesting these pathways are most relevant in cancer biology. These properties of Crk proteins make them potential cancer prognosis markers and therapeutic targets for metastasizing tumors, and these studies are under active investigation in the lab. One of the main interests in our laboratory focuses on the mechanisms by which Crk induces breast cancer invasion and metastasis, which is the most lethal form of breast cancer. The physiological fate of cells that die by apoptosis is their efficient recognition and clearance by phagocytes, a term called efferocytosis in recent years. In fact, each day billions of cells in our bodies die by apoptosis, and are rapidly and effectively engulfed by phagocytes in non-inflammatory process that maintains tolerance. Pathologically, highly proliferating tumors also have a high rate of apoptosis and many apoptotic cells are produced in the tumor microenvironment. We are investigating the idea that tumor phagocytes produce paracrine immunosuppressive factors that prevent our immune system from killing cancer cells. We are using a combination of molecular and cellular biology, mouse models, structural biology, and drug design to tackle these problems. Breast cancer cells (stained red) are very active in engulfing apoptotic cells (stained green). The importance of tumor phagocytes in cancer progression is well studied, and likely plays an under-appreciated role in tumor progression and immune suppression. Often tumor cells engulf several apoptotic cells. The ultimate goal of anti-cancer therapeutics is to induce tumor cell death and prolong patient survival. However, therapeutic responses in vivo after radiotherapy and chemotherapy are unpredictable, where patients can experience successful elimination of tumor burden and remission, to tumor progression and disease relapse. In vivo, the clinical success from chemotherapy and immunotherapy is associated with immunogenic death (ICD) of tumor cells, a form of apoptosis associated with the activation of an anti-tumor response. ICD involves changes in the composition of the apoptotic cell surface, as well as the release of soluble immunogenic signals that occur in a spatial and temporal pattern to activate immune responses. ICD is characterized by the early cell exposure of calreticulin (CRT) and subsequent release of high mobility group box-1 (HMGB1), which are required for the uptake of apoptotic cells and tumor antigens by dendritic cells (DCs) and the presentation of tumor antigens to T cells. In addition, the release of ATP from apoptotic cells causes P2RX7 purinergic receptor-dependent activation of the NLRP3 inflammasome in DCs, thereby inducing IL-1β and polarization of antigen-specific CD8+ T cells towards a Th1 cytokine pattern. These attributes are consistent with decades old mouse data that chemotherapy fails in immunocompromised mice. More recent clinical studies in humans show that therapeutic failure in vivo can result from failure to undergo ICD whereby tumors that are intrinsically unable to undergo ICD are incurable by irradiation of chemotherapy. These observations indicate that immune activation leading to anti-tumor responses is a primary determinant for long-term success in current anti-cancer therapies. TAM receptors (Tyro-3, Axl, and Mer) are a family of three homologous receptor tyrosine kinases (RTKs) expressed mainly on differentiated myeloid-derived hematopoietic and epithelial cells. They are unique in the RTK family due to their unusual extracellular domains (two tandem Immunoglobulin (Ig)-like domains followed by two Fibronectin (Fn) type-III repeats) that are more typical for cell adhesion molecules than RTKs. In addition to their expression on myeloid cells, we have shown that both Axl and Mer are over-expressed in aggressive, metastatic prone tumors, and play a unique role in tumorigenesis by enhancing the interaction between apoptotic cells and tumor cells in the tumor microenvironment. In blood-separated tissues such as the mammary gland, epithelial cells utilize their own tissue-specific non-professional phagocytes for apoptotic substrate clearance and immunosuppressive cytokine production that will be augmented by TAM-overexpression. 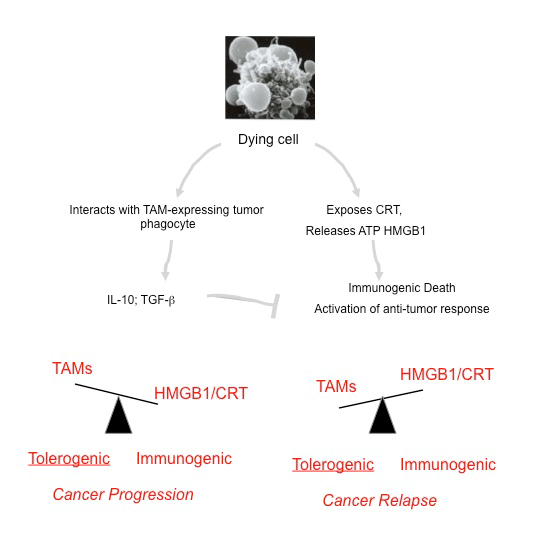 We are actively testing the idea that enhanced tumor phagocytosis by TAMs in epithelial cells produce factors subvert immunogenic death and drive tolerance to tumor antigens. Projects in the laboratory include the development of soluble receptors and small molecular TAM antagonists that may improve our understanding of factors that enhance tumor vaccine models. We hope this research will open up a new dimension in cancer biology whereby TAM-expressing tumor phagocytes can be therapeutically targeted to break tolerance and reactivate tumor immunity. TAM receptors (overexpressed on many solid cancers such as breast and lung cancer) may stimulate engulfment and drive tolerance in the tumor microenvironment. These factors would suppress immunogenic death and lead to immune evasion and tumor progression. 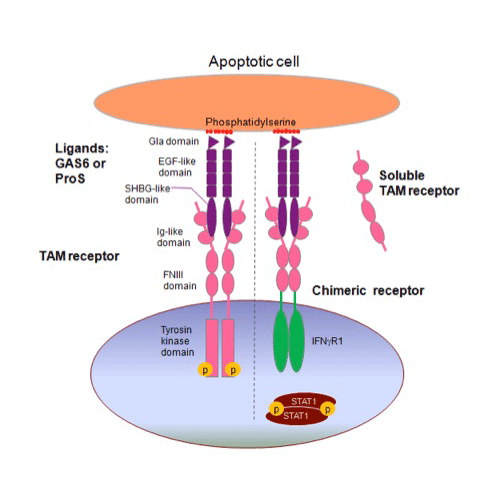 TAMs bind to apoptotic cells through exposed phosphatidylserine on the apoptotic cells. This leads to immune suppression and the production of tolerogenic factors.